Leeds civic leaders and scheme partners have gathered to celebrate the official opening of a major new affordable housing development in the city for the over 55s. Stratford Court, sited in the heart of popular Leeds suburb Chapel Allerton, includes 19 homes for affordable rent and nine for shared ownership. All units have now been taken. The £3.2 million development, within a dedicated conservation area, was delivered by Leeds-based Unity Homes and Enterprise in partnership with Leeds City Council and the Homes and Communities Agency. The ceremonial ribbon was cut by Coun Richard Lewis – the council’s executive member for regeneration, transport and planning – followed by a tour for invited guests and an opportunity to meet residents. Ali Akbor, chief executive of Unity Homes and Enterprise, said the new scheme was a prime illustration of what partnership working could achieve in addressing the affordable housing shortage in Leeds. Mr Akbor said: “Since our establishment as a housing association almost 30 years ago, Unity has been resolute in its determination to raise housing standards in the neighbourhoods we serve. “But we cannot do this alone and the support we have received from Leeds City Council and the Home and Communities Agency has been invaluable. This includes help to replace out of date and inappropriate accommodation with modern homes fit for our older population. 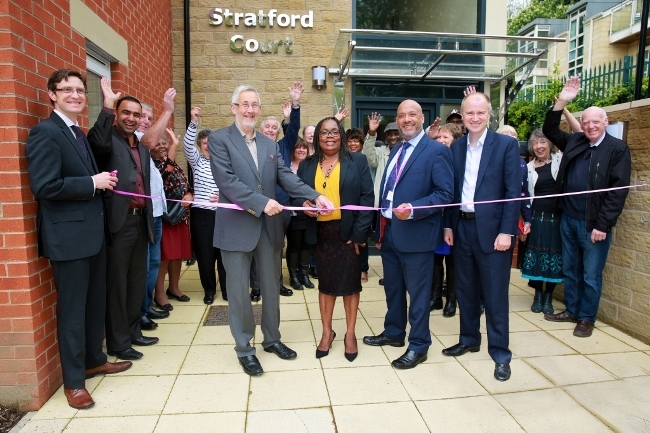 Coun Lewis, Leeds City Council’s executive member for regeneration, transport and planning, said: “Stratford Court is a great demonstration of how we can work with providers and developers to create homes that fulfil a specific housing need. “With an ageing population, we need to provide homes that cater to a range of needs and that embody the best in design and environmental credentials.